Creek clean ups are one of my favorite activities. Keeping the water supply clean is important to me. But Beech Creek in my neighborhood does not need cleaning with a broom. Why is there a broom in the creek? I commend the folks at Metro Public Works, Metro Water and Metro Public Health for moving quickly on this blog’s report about the dry wall spackle dumped in our storm drain. Metro Water sent someone out to inspect the drain and to check if the substance had made its way to Beech Creek where our storm water drains to the Harpeth River. If we knew who the contractor was, Metro Health will send him a Notice of Violation. There is a number to report dumping into storm drains. The number in Davidson County is 615.313.PURE. It is best to find the person in the act of the dumping. In this case, it’s also environmentally hazardous. When I read my homeowner’s association newsletter yesterday, I was upset to read that someone had spray painted on the dry rock bed in Beech Creek, which runs through our subdivision. 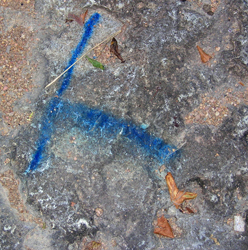 Tonight, I ran down to my favorite part of the rock bed, and found this blue paint. I hope that this is all of the spray paint. I found lots of frogs and their eggs in the area in the spring. I love to walk along the bed in the spring and fall with my dog. Dumping or spray painting into a creek is just stupid. This pollutes the environment and our drinking water. If I learn of additional spray painted spots in our creek bed, I’ll highlight them on the blog, as well as contacting our local officials. It’s a crime.